بنی‌عامریان, جمال ‏الدین, اسکوئی, بهروز, ایمانی, پریسا. (1391). سیگنال تحلیلی و مشتق‏های میدان پتانسیل از مرتبه کسری (کاربرد ‏در تفسیر و پردازش). 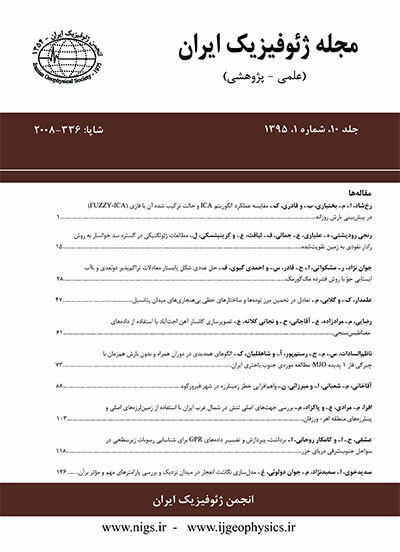 مجله ژئوفیزیک ایران, 6(3), 1-16. جمال ‏الدین بنی‌عامریان; بهروز اسکوئی; پریسا ایمانی. "سیگنال تحلیلی و مشتق‏های میدان پتانسیل از مرتبه کسری (کاربرد ‏در تفسیر و پردازش)". مجله ژئوفیزیک ایران, 6, 3, 1391, 1-16. بنی‌عامریان, جمال ‏الدین, اسکوئی, بهروز, ایمانی, پریسا. (1391). 'سیگنال تحلیلی و مشتق‏های میدان پتانسیل از مرتبه کسری (کاربرد ‏در تفسیر و پردازش)', مجله ژئوفیزیک ایران, 6(3), pp. 1-16. بنی‌عامریان, جمال ‏الدین, اسکوئی, بهروز, ایمانی, پریسا. سیگنال تحلیلی و مشتق‏های میدان پتانسیل از مرتبه کسری (کاربرد ‏در تفسیر و پردازش). مجله ژئوفیزیک ایران, 1391; 6(3): 1-16. مشتق‌های افقی و قائم میدان معمولا در تعیین لبه‏ها و مرزهای توده‏های گرانی و مغناطیسی و همچنین درحکم ابزاری مهم در روش‏های تفسیر و پردازش داده‏های گرانی و مغناطیسی مورد استفاده قرار می‏گیرند. به‏طورکلی مشتق‌های میدان پتانسیل به دو گروه مشتق‌های افقی و قائم تقسیم می‏شوند. مشتق‌های میدان را می‏توان به دو روش اندازه‏گیری مستقیم (هنگام برداشت داده‏ها) و محاسبه با استفاده از روش‏های ریاضی به‌دست آورد. مشتق‌های میدان فیلترهای بالاگذر (High pass filter) هستند و موجب تقویت دامنه نوفه‏ها (noise) و بی‌هنجاری‌‌های سطحی می‏شوند و با افزایش مرتبه مشتق‏گیری دامنه این طول موج‏های کوتاه با شدت بیشتری تقویت می‏شوند، بنابراین مشتق‌های مرتبه بالا کاربرد چندانی ندارند. بااین‌حال به‌جای مشتق‌های مرتبه بالا می‏توان از مشتق‌های مرتبه کسری (fractional order derivative) میدان استفاده کرد. از مشتق‌های افقی مرتبه کسری میدان می‏توان به جای انتقال به قطب (Reduction to the pole) داده‏ها در عرض‏های پایین استفاده کرد، دراین‌‌صورت مشکل ناپایداری داده‏ها در انتقال به قطب در عرض‏های پایین، برطرف می‏شود. در این مقاله روش‏های محاسبه مشتق‌های میدان، چگونگی تغییرات آنها با تغییر مرتبه مشتق‏گیری، استفاده از مشتق‌های کسری در روش سیگنال تحلیلی و به‏کارگیری مشتق‌های افقی مرتبه کسری به‌‏جای انتقال به قطب داده‏ها بررسی می‏شود. برای ارزیابی اثرات مشتق‌های مرتبه متفاوت، این روش روی داده‏های مصنوعی ناشی از مدل‏های مصنوعی گوناگون اِعمال می‏‏شود. به‌این‌منظور ابتدا با استفاده از مدل‏سازی به روش پیشرو، برای مدل‏های مغناطیسی ساده از قبیل دایک نازک و استوانه افقی داده‏های مصنوعی تولید می‏شود. در مرحله بعد برای برآورد واقعی‏تر داده‏های واقعی، به داده‏های مصنوعی تولید شده نوفه اضافه می‏شود. درنهایت این روش روی داده‏های مغناطیسی هوابردی برداشت شده در منطقه‏ای واقع در کشور سوئد مورد استفاده قرار می‏گیرد. با توجه به تحقیقات زمین‌شناسی صورت گرفته، در این منطقه یک توده گرانیتی با چند شکستگی وجود دارد، که در داخل این شکستگی‏ها رگه‏هایی از دیاباز نفوذ کرده است. نتایج به‏دست آمده نشان می‏دهد که مشتق‌های مرتبه کسری و همچنین مشتق‌های مرتبه منفی میدان را می‌توان درحکم ابزاری کمکی در تفسیر و پردازش داده‏ها مورد استفاده قرار داد. همة مراحل محاسباتی با استفاده از برنامه‏های رایانه‏ای که با استفاده از نرم‌افزار مَت‌لَب ازسوی نگارندگان نوشته شده است، صورت می‌گیرد. Horizontal and vertical gradients of the potential fields are used routinely to enhance the edge of the magnetic and gravity sources; furthermore, they are used as useful tools in interpreting and processing of magnetic and gravity data. In general, the derivatives of the potential fields are divided into horizontal and vertical derivatives, and they have always been significant tools in interpreting and processing of potential data. The derivatives can be determined in two procedures, direct measuring when the data are recorded, and calculation using mathematical and numerical methods. Many interpreting methods, that estimate the depth, location and the shape of a potential source, are based on using the gradients of potential fields. For example, both analytic signals and Euler Deconvolution methods, that have been widely applied, basically use the potential field derivatives. In these methods, different kinds of first order derivatives or derivatives of other positive integer orders are commonly used. In the basic equations of these methods, it is possible to use the derivatives of fractional orders in place of derivatives of other positive integer orders. Derivatives are high pass filters. They intrinsically amplify any noise and shallow anomalies present in the data. Therefore, using high order derivatives would be less common. Instead of using high order derivatives, one should use fractional order derivatives of the field. Besides, negative order derivatives are applicable in these kinds of methods and equations, and they can be considered as an interesting property of negative order derivation that acts as a low pass filter. In addition, horizontal fractional derivatives can be used instead of reduction to the pole at low latitudes to eliminate the instability of the reduced data. In this paper, the methods of the field gradient calculation, their alternation, and the application of the fractional order derivatives in analytic signals and reduction to the pole were inquired. To study the effects of the derivatives of different orders, the method was applied to synthetic data generated by various magnetic models such as a thin dike, and a horizontal cylinder. In the next stage, to simulate the real cases, the data was contaminated by random noise. To produce the synthetic data, the forward modeling was used. Finally, the method was applied to an aeromagnetic data set acquired over an area in Sweden. According to the geological studies in this region, there exists a granite intrusive body with certain fractures in which Diabase veins have penetrated. The results show that the fractional order derivatives as well as negative order ones are useful in data processing, and they can be considered as the principle of some of interpreting methods. All of the processing steps in this paper have been performed by using the code that we have written in Matlab. بنی‏عامریان، ج، 1388، روش ترکیبی سیگنال تحلیلی و واهمامیخت اویلر (AN-EUL) در تفسیر داده‏های مغناطیسی، پایان‏نامه کارشناسی ارشد ژئوفیزیک، موسسه ژئوفیزیک دانشگاه تهران. بنی‏عامریان، ج، 1387، مروری بر روش‏های محاسبه مشتقات میدان مغناطیسی وگرانی (میدان‌های پتانسیل)، سمینار کارشناسی ارشد ژئوفیزیک، موسسه ژئوفیزیک دانشگاه تهران. Atchuta Rao, D., Ram Babu, H. V., and Sanker Narayan P. V., 1981, Interpretation of magnetic anomalies due to dikes: The complex Gradient method: Geophysics, 46, 1572–1578. Bastani, M., and Pedersen, L. B., 2001, Automatic interpretation of magnetic dikes parameters using the analytic signal technique: Geophysics, 66, 551–561. Bin Doo, W., Hsu, S. K., and Yeg, Y., 2007, A derivative-based interpretation approach to estimating source parameters of simple 2D magnetic sources from Euler deconvolution, the analytic-signal method and analytical expressions of the anomalies. Geophysical Prospecting, 55, 255–264. Blakely, R. J., 1995, Potential Theory in Gravity and Magnetic Applications. Cambridge Univ. Press. Cooper, G., and Cowan, D., 2003, The application of fractional calculus to potential field data: Exploration Geophysics, 34, 51–56. Cooper, G., 2008, Euler Deconvolution with Improved Accuracy and Multiple Different Structural Indices: Journal of China University of Geosciences, 19(1), 72–76. Danes. Z. F., and Oncley. L. A., 1962, An Analysis of some second derivative method: Geophysics, 11, 611-615. Elkins,T. A., 1951, the second derivative method of Gravity interpretation: Geophysics, 23, 29-50. Evjen, H. M., 1963, the place of vertical gradient in Gravitational interpretation: Geophysics, 1, 127-136. Hood, P., and McClure, D. J., 1965, Gradient measurements In ground magnetic prospecting: Geophysics, 30, 403-410. Hsu, S. K., Sibuet, J. C., and Shyu, C. T., 1996, High-resolution detection of geologic boundaries from potential anomalies: An enhanced analytic signal technique: Geophysics, 61, 373–386. Hsu, S. K., Yeh, Y., and Doo, B., 2007, A derivative-based interpretation approach to estimating source parameters of simple 2D magnetic sources from Euler deconvolution the analytic-signal method and analytical expressions of the anomalies: Geophysical prospecting, 55, 255–264. Keating, P., and Pilkington, M., 2004, Euler deconvolution of the analytic signal and its application to magnetic interpretation: Geophysical Prospecting, 52, 165–182.